Collection>The danish golden age>Claus Anton Kølle>Kølle C. A. Oil on canvas, 66 x 54 cm. Inspired by Eckersberg, C. A. Kølle completed several architectural paintings in connection with his stay in Rome. Following in his teacher’s footsteps, he painted both the Temple of Vesta and the Colosseum. In this painting, Kølle has depicted the Basilica of Saint Nicolas of Tolentino in the bright daylight of Southern Europe. On the gravel road, a person walks with his back to the church, while fresh blue hues dominate the sky above. Although the church forms the centre of the composition, it is partially overshadowed by the walls along the gravel road, and the eye is instead drawn naturally towards the gently rustling vegetation along the roadside as well as the majestic pine tree. The artist has accordingly not sought to paint a clear representation of the church’s architecture, instead focusing on highlighting its environs. 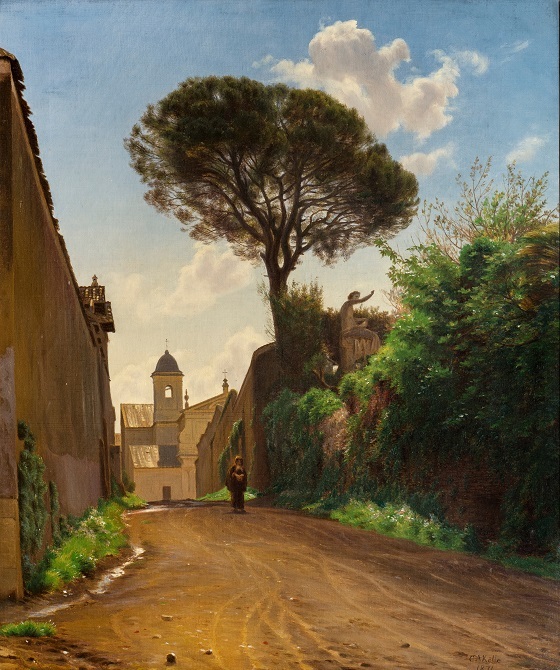 The painting is also very similar to Constantin Hansen’s A street in Rome from 1837 (National Gallery of Denmark), which had the same street as its subject.